The InBio project has been selected in the context of a call for new research groups organized by the Center for Bioinformatics, Biostatistics and Integrative Biology (C3BI) of Institut Pasteur. The main scientific question investigated in InBio is how one can exploit cell-to-cell differences to better learn and control the functioning of biological systems. That is, instead of seeing phenotypic variability as undesired noise that beclouds the processes of interest, we will try to harness cellular heterogeneity. In particular for control problems, because one interacts with the system, it is important to be able to predict the dynamical evolution of phenotypic heterogeneity. A second important scientific objective of InBio is to develop more rational and systematic interactions between experimental and computational work. The virtuous loop in which experiments nurture models, that in turn, orient further experiments is universally acclaimed and installing such a loop is a central objective of many research projects. In interdisciplinary research, it is expected that this exchange of information will emerge from the interactions between the two disciplinary groups. For both practical and theoretical reasons, this is actually often not the case. In InBio, we will adopt a multidisciplinary research approach and develop an integrated environment around the design-and-test loop. This will notably involve the rational design of cell stains and of experimental plans, so that experiments are maximally-informative, and of efficient model calibration and discrimination methods. This specific focus explains the full name given to the InBio group: “Experimental and Computational Methods for Modeling Cellular Processes” (InBio simply abridges integrative biology). InBio will be hosted at Institut Pasteur and will host experimental and theoretical research. It is a mixed structure between Inria (action exploratoire attached to Lifeware) and Institut Pasteur (research unit attached to the C3BI), and is headed by Grégory Batt. Our long-standing and tight collaboration with Franck Delaunay's lab in Nice culminated this year with a revisiting of the dogma of the control of the cell cycle by the circadian clock. In  we showed, using a coupled reaction model of the cell cycle and the circadian clock and BIOCHAM analysers , that a selective upregulation of Reverb-α (or an inhibition of Bmal1) during mitosis is necessary to explain the period and phase data observed in NIH3T3 fibroblasts in different serum concentrations. This mechanism constitutes a reverse control of the circadian clock by the cell divisions which was previously outlooked but is overriding in some spontaneously dividing cell types such as non-confluent NIH3T3 fibroblasts. 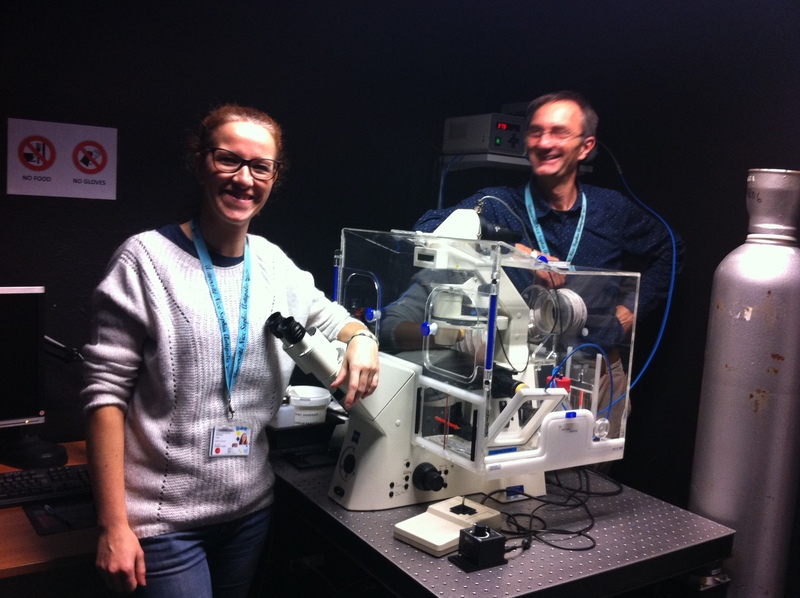 with the large-scale time-lapse video microscope which produced the unicellular 72h data studied in .